Encouraged by bellicose campaign rhetoric during the 2012 US presidential election campaign, Israel launched a strike against suspected Iranian nuclear facilities in January 2013. Iran retaliated not only with largely ineffectual missile attacks against Israel itself, but also by using various proxies to target US troops in Afghanistan, Iraq, and the Gulf. When a US tanker was sunk off the Saudi coast by a mysterious explosion, President Palin ordered military strikes against Iranian military and political targets. Within weeks, US ground troops had entered Iran. War had started. While Iranian resistance has been fierce, a small US force has broken through Iranian lines. Can the US exploit this opening? Or will local Iranian Basij militiamen hold off the US force long enough to be reinforced by elements from a nearby Iranian Revolutionary Guards mechanized battalion? Iranian Pasdaran commander Tomminejad surveyed the map, as he readied his forces to counter the imperialist offensive. It seemed clear that the primary American objective would be Hill 103, offering as it did commanding views of the village of Khater, the twon of Nahr-e-Sheykh, and the main road connecting them. At the moment, Khater itself was held by two lightly-armed platoons of Basij militia. A third platoon of militia and The Basij company headquarters were entrenched near the pistachio farm near Hill 106. A small anti-aircraft unit on Hill 104 overlooked the main road. Given this, he decided upon the following plan. His best tanks—a platoon of Russian-made T-72s—would move forward to take Hill 105, and from there offer fire support to the Iranian forces in Khater. A mechanized infantry platoon in BMP-2s and a unit of jeep-mounted 106mm recoilless rifles would assist them in taking the objective. Meanwhile, a platoon of Chinese-made Type 59s tanks would move forward rapidly to join the defenders of Khater. On the Iranian left flank, two infantry platoons in M113 armoured personnel carriers would advance to Nahr-e-Sheyh. If the town seemed secure, they would then push on to assist in the defence of Khater. Finally, he would take his own headquarters platoon to the heights of hill 104, from where he would have a good view of the battle below. The mortar platoon would set up there too, sheltered behind the reverse slope of the hill, and providing fire support to the units below. 1 scout platoon with four M3 Bradleys, plus two HMMWVs with 0.50 calibre machine-guns. Col. Daryl S. Patton surveyed the satellite imagery of the area ahead of his small ad hoc force. His one platoon of M-1 Abrams tanks would be a critical asset in the coming battle, and he wanted to deploy them where they could contribute the most. Hill 103 was a possibility, but it was dangerously close to an area of irrigation trenches and standing crops where Iranian infantry might hide. Instead, he would send the tanks—together with his own headquarters, and an attached artillery observer—to Hill 105. Around those commanding heights there was little cover that might shelter an attacking force. His main effort would be to clear Khater, and the road leading on to Nahr-e-Sheykh. 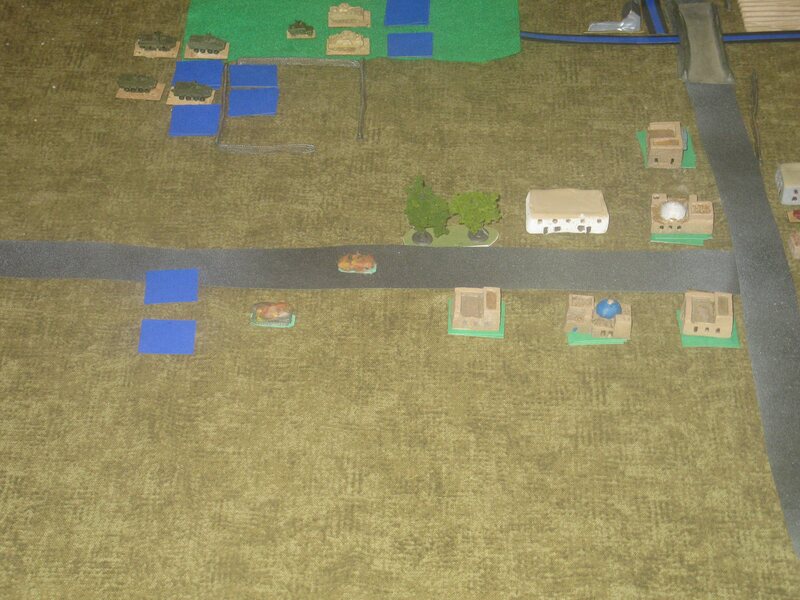 The two Stryker platoons would advance to seize the village. 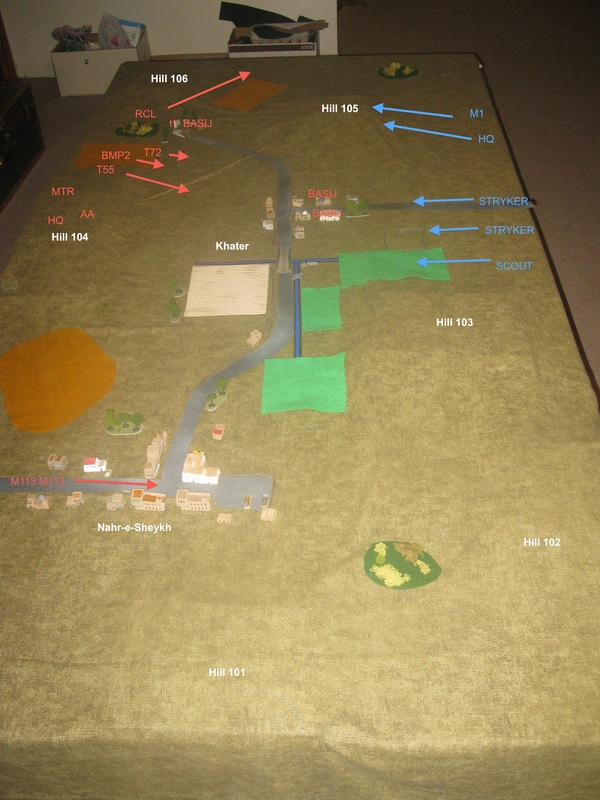 A scout platoon in M3 Bradleys would, together with two HMMWVs, probe to the west of the village, securing the cropped fields, irrigation ditches, and hill flank against any possible Iranian counterattack. 1000: The powerful engines of the 70 ton M1 Abrams roared as the four tanks drove quickly across the hard-packed ground and up the slopes of Hill 105. To their left, eight Stryker APCs moved forward to the edge of Khater, preparing to dismount their soldiers. Suddenly, about 200m outside the village, there was a bang, followed by a large explosion as the lead Stryker tripped an Iranian EFP off-route mine and burst into flames. As the other vehicles of the platoon moved to recover the casualties, a volley of RPGs was fired towards them from the Basij militia in the village. While most went wild, one lucky shot hit a second Stryker, destroying it. Within minutes, half of the lead American platoon had been put out of action. The other Stryker platoon hurriedly disembarked its platoon behind the shelter on a low stone wall, as they prepared to return fire. To their flank, the Bradleys moved forward, checking the fields for any sign of the enemy. A kilometer away atop Hill 104, Iranian 37mm and 23mm anti-aircraft canon began to fire on the Americans below. It wasn’t the start that Col. Patton had hoped for. There was, however, some good news. Headquarters reported that an AH-64 Apache was inbound to provide fire support. 1015: The Iranian tank commander was nervous. He had been assured that any American armour would be much further from his position, yet already there were reports that American tanks had been seen nearby. Nevertheless, he and the BMP platoon accompanying him advanced towards their objective, Hill 105. 1027: The Apache helicopter flew up the American right flank, hovering low behind Hill 105. In the distance, four small vehicles could be seen travelling at high speed towards the US position, attempting to flank them. The helicopter lined up on them, and the gunner fired off both pods of Hydra 70 rockets. The lead jeep burst into flames. With this, the attack helicopter moved to the other flank of the hillside. There was a sudden rattling as the Iranian ZPU-23-2 on the hill loosed a burst of 23mm cannon fire at them. While a few warning lights came on, the chopper was still airworthy. It prepared to open fire on the Type 59s now advancing rapidly towards Khater. 1033: The US forward observer on Hill 105 could see considerable enemy activity atop Hill 104, and radioed a request for fire support from US artillery. A positive response was received: rounds would be incoming in a few minutes. One of the Bradleys in the fields near Khater spotted the dug-in Iranian 37mm AA truck some 1,200m in the distance, and opened fire with its own 25mm chain gun. The Iranian vehicle is destroyed. 1035: Iranian mortars open fire on US troops approaching Khater. The BMP platoon pulls back to the pistachio farm and requests new orders. 1036: A distant battery of American M109 155mm guns open fire on the top of Hill 104. The first rounds land right on target, and moments later secondary explosions can be heard as two vehicles belonging to the Iranian mortar platoon start to burn. 1038: The Apache opens fire on the lead Type 59 with a Hellfire missile, destroying it. A minute later, a second Hellfire leaves another Iranian tank in flames. By this time, however, it is clear that the Iranian AA fire did more damage than expected, and the helicopter swings around to return to base and repair. As it does so, it is caught once more by a burst of 23mm fire. It starts to smoke and spin out of control, and then crashes to the ground. The two M113 platoons in Nahr-e-Sheykh are ordered to advance towards Khater. The US forward artillery observers spots the Iranian mechanized infantry in the town, and requests an artillery barrage. He is overruled by brigade HQ: US rules of engagement do not permit the use of area fire in densely-populated areas. 1045: US troops continue to cautiously advance around Khater, taking heavy but generally inaccurate fire from the sixty or so militia in the village. Another lucky RPG shots destroys an empty Stryker, however. It’s not enough. The vehicles have only just left the farm when they come under fire from the US tanks on the hill. Three BMPs are destroyed immediately, and the fourth pulls back once more. 1105: the commander of the Iranian anti-tank platoon notices that one of the US tanks, shifting position on the hilltop to better engage the BMPs, has exposed his side armour. 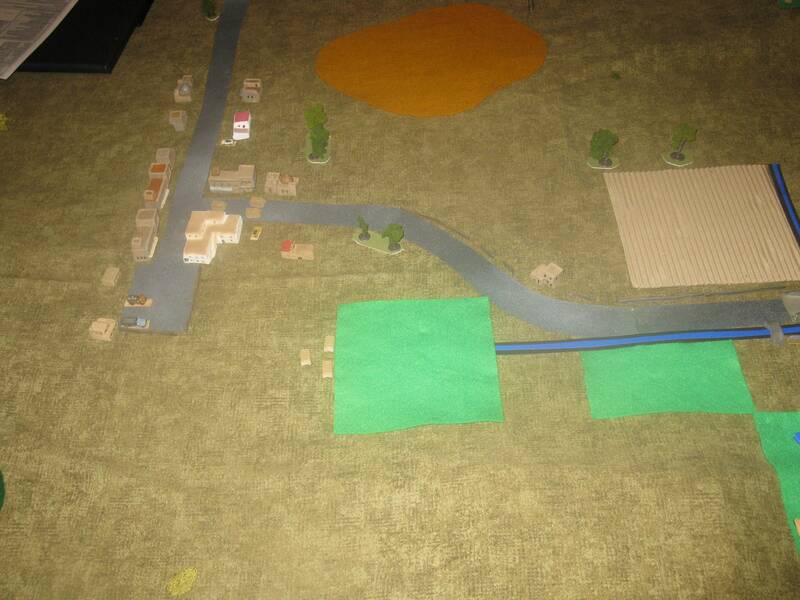 His jeeps dash to a firing position, train their two remaining recoilless rifles at the Abrams, and fire. The HEAT round penetrates the side of the US vehicle, causing it to explode. 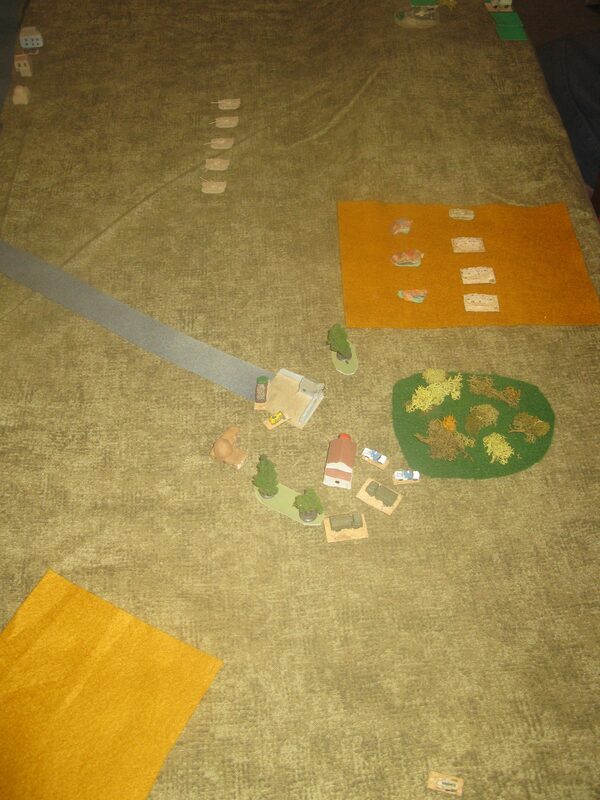 The jeeps drive on, seeking cover behind a nearby woods, but en route one is destroyed in US return fire. (Picture, right: Three Iranian jeeps—two mounting 106mm recoilless rifles, one mounting a light machine-gun—celebrate destruction of an M1 Abrams 700m away on Hill 105). 1115: One Iranian M113 platoon disembarks its infantry at a house on the road to Khater, and then advances towards the brudge to use its machine- guns in support of the beleaguered militia in Khater. Almost immediately the thinly-armoured Iranian APCs are shredded apart by 25mm fire from the Bradleys. The Iranian infantry cautiously advances behind the cover of a stone wall, engaging in the US scout platoon in a long-range firefight. 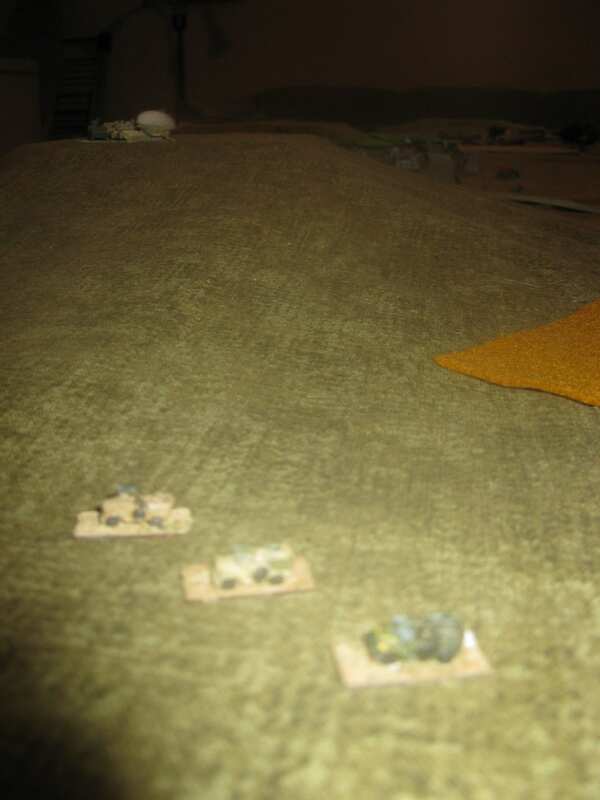 The other Iranian M113 platoon advances up the slops of Hill 103, preparing to disembark its infantry in a position where they can fire down on Americans below. As it does so, there is a tremendous crescendo of explosions as a battery of IRGC multiple rocket launchers unleashes its deadly salvo on the field where the US scouts are carefully moving forward. The Iranian artillery observer on Hill 104 has slightly misjudged the distance, however, and the barrage overshot a little. 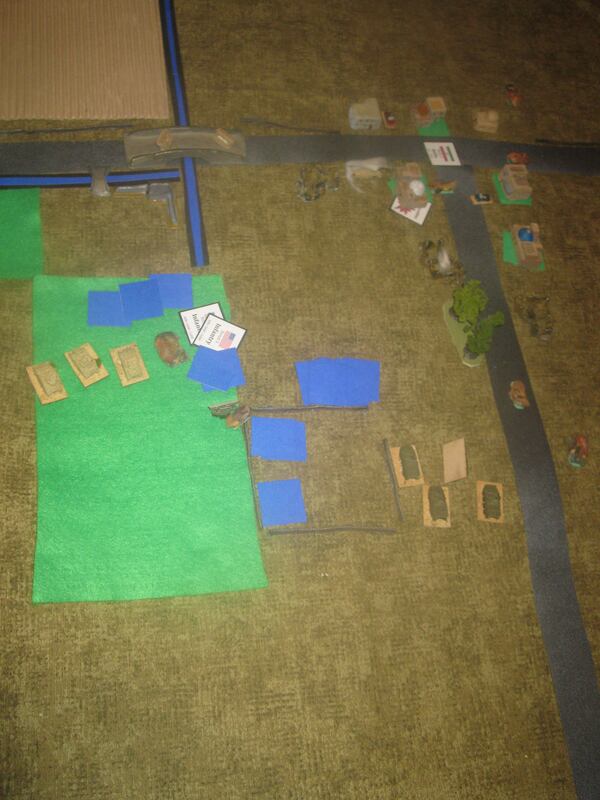 Still, a dozen American soldiers are casualties, and the scout platoon goes to ground. 1117: First one, then another of the lightly-armoured HMMWVs of the Scout platoon are disabled by Iranian fire. 1120: The US artillery observer shifts the fire on Hill 104, hoping to eliminate the Iranian mortar crew there. While one mortar is destroyed, the US is unable to bring effective fire onto the second. 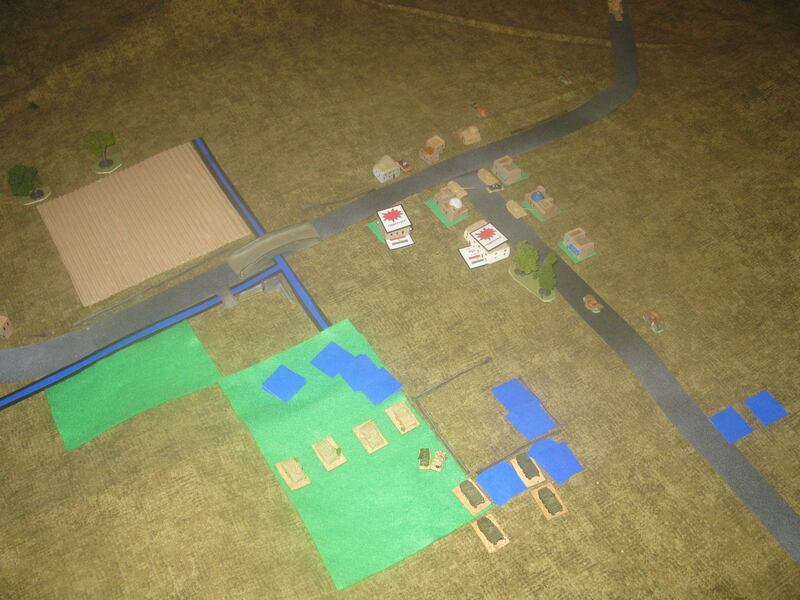 Meanwhile in Khater, US infantry clear the enemy from two houses as they slowly press on. They’re aided now by direct fire from the American tanks on Hill 105, who pump 120mm high explosive rounds into those houses where Basij positions have been confirmed. To the rear of the tanks’ position, the Stryker and HMMWV of the HQ platoon fire upon the Iranian anti-tank platoon with machine-guns, as the latter plays cat-and-mouse with the American forces from behind a small grove of date palms. 1130: A Single ATGM fired from the BMP some 1,500m away at the pistachio farm hits an Abrams in the rear engine compartment, starting a fire. The crew are forces to abandon the vehicle, and the US tank platoon is down to only two operable vehicles. The Basij at the farm load into trucks, and start driving towards Khater. The Basij commander gets in a pick-up truck, and starts a suicidal charge towards US lines. His truck is hit moments later by a US tank round. 1132: The single BMP at the pistachio farm is fired upon by US tank fire, but missed. 1135: Iranian troops on Hill 103 fire a volley of RPGs at the three Bradleys below them in the field. One is hit, but the weapon fails to detonate. In return, American forces start to return fire with small arms and the 25mm guns on the Bradleys, immediately cutting down several of the Iranian infantry teams. The tanks notice the M113s atop Hill 103, and open fire on them. IRGC commander Tomminejad, observing the battlefield from a BTR-60 atop Hill 104, is spotted by an Abrams, which swiftly grants him martyrdom. The Iranian force is now unable to issue new orders. 1145: The US tanks spot three trucks driving across country towards Khater. They fire upon the Basij platoon, destroying all three. While almost half the Basij platoon has been lost, the fanatical survivors press on by foot towards Khater. At this point, the battle came to an end. Although flanked on two sides, US forces are in no in danger of being overrun. On the other hand, pressing ahead to Khater would be slow and costly. Nahr-e-Sheykh is firmly in Iranian hands. Excellent accounting of the successful defense of Khater by the Holy Forces of the New Persian Empire. However, it should e noted that the US did not destroy the heroic BMP in the pistachio fields. Additionally, I have survived. 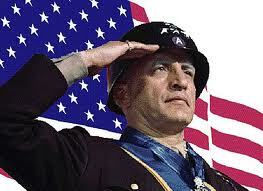 Once I recover from my wounds I shall be ready to lead my forces anew against that Great Satan, General Daryl!!! !